Students typically learn about the history of their nation and other nations from the comforting culture of their own country. ESL students who move to the U.S. have the added challenge of learning an additional perspective on history. Moving from a foreign culture is a historical experience in and of itself, and these students often have a lot to contribute to history and social studies discussions. ESL teachers and social studies teachers need to employ special strategies to effectively reach out to this special population. After working in the discipline for some time, and even from being a student of the subject, you likely have realized that world history in American classrooms is taught from a Eurocentric point of view. History is viewed from the eyes of a European or is centered around European culture and history. Teaching social studies to ESL students requires a teacher to shift to a more worldy viewpoint. ESL students have not all resided in Europe before coming to the United States, and they do not all hold the same perspective of world history. Recognizing the eyes through which they see history, whether your students are Chinese, Australian, Irish or another culture, should be at the core of your instructional methods. While remaining sensitive to the cultural needs of students should always be a part of your every day approach, this becomes particularly important when you have ESL students in the classroom. No cultural practice should be belittled. No matter how far back in history your class travels, do not mock a practice. The ESL student(s) in your classroom may follow those religious or cultural ways. The minute you offend a student, you have alienated him or her from your classroom. History courses, much like reading and writing courses, can be particularly overwhelming for ESL students. Unlike their United States-born peers, they have not had the experience of growing up submerged in American culture. Concepts that a United States-born student may have known since birth, such as the recitation of the Pledge of Allegiance or the tales of the Civil War or Revolutionary War, may be entirely unfamiliar to an ESL student. To successfully teach social studies and history, you need to reinforce the knowledge of your ESL students, draw them into the discussion and supplement their knowledge where necessary. If you are teaching a course in American history, you might fairly assume that everyone knows who George Washington was or that all of the students are aware of the story of the first Thanksgiving. For a student who has never celebrated Thanksgiving before, this concept can be alien. Always take the time to go back to the basics and explain the entire story before asking students to picture the events. With numbers and math, students may be able to quickly translate into their native tongue and to understand the concepts. However, this is often not the case for social studies. Imagine that you are teaching about the existence of major world religions, and you note that Roman Catholics believe in the Trinity. In your class, you may have an ESL student who comes from an atheist country. He or she is likely going to have no idea what the word "Trinity" even means. Without the basics of the language, the rest of the lesson might not make sense. Consider providing word lists or reviewing vocabulary with the entire class before beginning a new unit or chapter in the book. Assign an activity where all of your students present information about their cultures within their small groups. Have students bring in a food dish from his or her background. Use visuals whenever possible instead of words. Many times an ESL student will recognize a picture of a famous person in history, even though they don't know the person's name. Encourage your ESL students to be active members of the class, but do not pressure them into answering questions. These tips for teaching social studies to ESL students can help each student to feel more a part of the class. Ultimately, social studies classes can provide an arena where students can embrace the differences among themselves. When you have ESL students in the class, encourage their participation and use their experiences to enhance your lesson plans. "Tips for Teaching Social Studies to ESL Students." YourDictionary, n.d. Web. 22 April 2019. 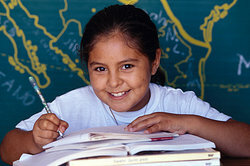 <https://esl.yourdictionary.com/esl/esl-lessons-and-materials/tips-for-teaching-social-studies-to-esl-students.html>. Students typically learn about the history of their nation and other nations from the comforting culture of their own country. ESL students who move to the U.S. have the added challenge of learning an additional perspective on history.Moving from a foreign culture is a historical experience in and of itself, and these students often have a lot to contribute to history and social studies discussions. ESL teachers and social studies teachers need to employ special strategies to effectively reach out to this special population.